This morning, at around 9:15am, an excavator digging in Chapel Street, Windsor hit an underground gas main causing a major incident. Fire crews rushed to the scene, as police shut down the busy street. News Corp reported that 30 people were evacuated from the area. A damaged underground utility is nothing new. In fact, underground cables and pipes get damaged every single day across Australia. But the fact that it happened on the popular Chapel Street shopping strip probably helped get it a bit more attention than most other damage gets. Route 78 trams in sections with no trams between Toorak Rd & Dandenong Rd due to an emergency services request on Chapel St. This will no doubt affect Yarra Tram’s performance targets, so I can imagine they won’t be too happy about it. Locally it was reported on nearly every Melbourne radio station. The Herald Sun had it in the afternoon edition of their online paper. It also made headlines across the country, with The Advertiser reporting it in Adelaide. While in Brisbane, it was in the Courier Mail. So, 7 ½ hours of chaos and mayhem—just because someone damaged an underground gas main. But we probably should be grateful, as this could have easily been a lot worse. Imagine what would have happened if the gas ignited! Now, we don’t know all the details of the works that were taking place here. So it’s hard to comment on who is at fault and why it happened in this particular situation. Did you have current Dial Before You Dig plans onsite? Did you read through them thoroughly and understand what your duty of care was when working in the vicinity of underground utilities? If you did have current DBYD plans on the site, was the gas main that you hit shown on the plans? If it was, then did you have it located before the works commenced? If you did have it located, then was it located by the gas company and/or a Dial Before You Dig certified locator? Or was it just by someone you found out of the Yellow Pages? If you did have the gas main located, then did you pothole to confirm its exact depth and location? Unfortunately, with these sorts of incidents, we never find out the whole situation. Well, that is unless it ends up in court. And that is only generally when someone gets hurt or an entire city gets affected by the damaged pipe. So we’ll never know exactly what happened here or who is to blame. But what we can tell is that if they can prove they have done everything in their power to reduce the chances of an underground utility being damaged, then they will be fine. Answering ‘YES’ to the majority of the questions above will generally mean that they’ve taken reasonable action in trying to avoid damaging an underground utility—and the fact that one still got damaged is an accident. But if they answered ‘NO’ to the questions above (well, other than the question about whether there was a gas main shown on the plan), then you can pretty much expect the authorities to throw the book at them. That’s because they could have just followed a few simple steps, which would have prevented this incident from happening. Has this happened to you in the past? Have you hit an underground gas main or other buried utility? If you operate an excavator and you’ve been in the industry for 5+ years, then the odds are that you have. Well, we would love to hear from you. Tell us from your point of view, as the guy on the machine, why these incidents happen and what advice you would give others in the industry so that this doesn’t keep happening. 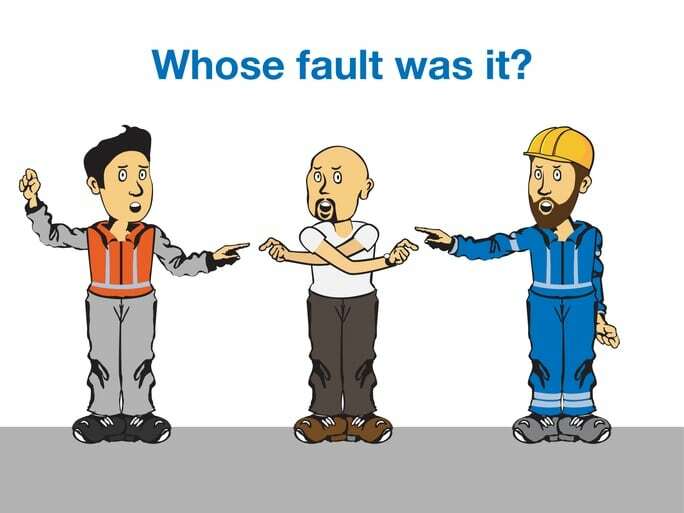 And even those of you who aren’t operators, but are supervisors or managers of the guys out on site: again, tell us why, in your opinion, do these incidents happen? And what advice do you give to others who are new to the industry about how they can avoid damaging the underground infrastructure? Just add your comments in the section below. Or, if you’re embarrassed or you don’t want your boss to find out that you are telling others of the mistakes that have been made on site, then just send us a private message. In that message, just state that you want to remain anonymous. We’ll then add your comments in for you and state that you wanted your name removed. Of course, we would prefer that you did use your real name. That way, other readers can see that the content provided is real and comes from others in the industry, who they can relate to. But if it means that you’ll share the truth with us, then we’re happy to anonymise your comments. Are you about to start digging? While we’re at it, we should really add something else here as well. If you’re about to start a project, and would like us to come out and tell you where the underground utilities are before you do any digging, then please feel free to give us a buzz, send us an email, or even just jump on the website and click the ‘book now’ button, which will take you to our live calendar—from which you can pick a time that suits you for us to come out to your site. Note that we do only work in Victoria, unless it is in exceptional circumstances. But if you’re reading this from interstate and would like some guidance on who to hire for your next project, then still feel free to get in touch and we might be able to give you a few tips.